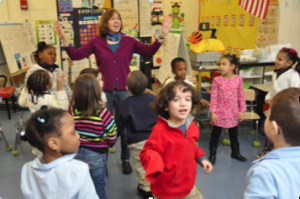 Liz’s work helps young children make connections to academic learning through the joy of music. Liz Buchanan specializes in creative ways to teach music and make connections to learning across the early childhood curriculum. Please contact Liz to find out more about scheduling performances and classroom sessions at preschools, libraries and community centers, or workshops for teachers on building early literacy skills through music. Liz holds a Masters in Education in Creative Arts in Learning from Lesley University, and an MFA in Writing from Vermont College of Fine Arts. She received her BA from Duke University. Liz has a rich singing voice that’s both beautiful and friendly that really attracts kids, especially shy ones. Her shows are very interactive and kids just seem to feel free to dance and be themselves with her. The music programs that Liz Buchanan runs balance innovation, joy and structure beautifully … and they always have a healthy dose of patience and flexibility. Young Audiences is lucky to have her as a teaching artist. Thank you for the delightful musical gathering on Wednesday. I was happy that we had a good crowd to enjoy your wonderful medley of songs. Your excellent mix of tunes supported audience participation and kept everyone engaged.